Two navy-officers-turned-CEOs are teaming up to deploy advanced ocean sensors in the Atlantic Canadian offshore. And the platform is a super-fast, 22-metre patrol boat built for the military that is being converted to civilian use. "We want to introduce a couple of new concepts to the commercial survey and data acquisition market in the ocean," said Jamie Sangster, CEO of LeeWay Marine. "One is speed and one of them is efficiency in terms of the crew we have on board." 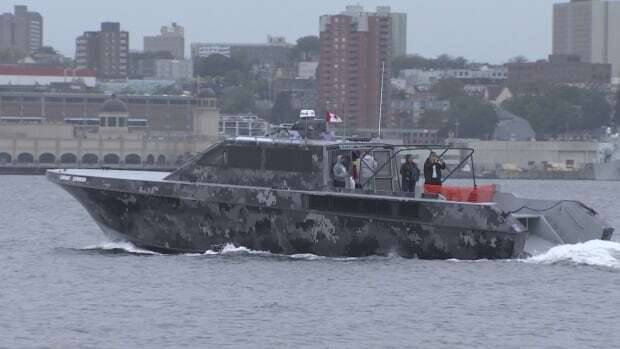 Sangster, a former architect with the Canadian navy, and his partners have been showing off the LeeWay Striker in Halifax this week complete with giant fantail wakes as the sleek and camouflaged vessel zooms through the harbour at 45 knots or over 80 kilometres per hour. Speed is the essence of the LeeWay business plan, which promises swift transit times to offshore locations. "What we want to do is create efficiency for our clients and get there quicker and with less crew on board, but still have the right capability once we arrive on scene to capture the data," said Sangster. This week, LeeWay Marine announced a co-operation agreement with Kraken Robotics of Newfoundland and Labrador, which has developed advanced ocean-mapping sensors in towed and underwater vehicles. Both companies see applications from the military hunting mines to oil companies wanting to measure and monitor platforms and pipelines. It could also be used to track airplane black boxes or the undersea communications cables that deliver the internet. "We're positioning this as the world's fastest mine-hunting and ocean-mapping platform," said Kenny. It took Sangster a year to get his hands on the SeaStriker, which was built at a cost of about $10 million in Tampa, Fla.
A military sale apparently never materialized for the contractor. Sangster won't say what he paid for it, other than it was a bargain and his team was "ruthless." The day rate, he said, will depend on the amount of diesel burned. Fuel consumption rates drop once the boat reaches speed and starts to plane across the ocean. Sangster said the goal is to charge far less than the rate for his other vessel, a much larger former Canadian Coast Guard ship, the LeeWay Odyssey. "Ships of that size range typically from $12,000 to $20,000 a day. The intent of this, if we do it right — and we will — will be much, much less than that." The arrangement between Kraken and LeeWay would appear to fit with Ottawa's decision to promote ocean innovation through the Ocean Supercluster. The consortium of private sector companies and universities was Atlantic Canada's winning entry in a federal government innovation competition. "It's creating high quality jobs, its creating products and technology for exports. It totally aligns with the cluster initiative," said Kenny. The goal is to get the LeeWay Striker out on the water earning its keep next March. First the vessel will have to be reconfigured to move the robotics payload to the stern where the equipment will be deployed from a storage area in the front of the vessel. That will entail building some sort of rail system on port and starboard side and some kind of lightweight gantry crane. The trick will be to do that while maintaining vessel speed. "We're not going to rush into this program," said Sangster. "We need to put the right thought and engineering into this, to get it right the first time."